Hotels By Day is thrilled to announce their partnership with corporate travel expense company Rocketrip. Hotels By Day has recently been added to Rocketrip Perks, an innovative program that combines exclusive discounts, accelerated loyalty status and other special offers just for Perks program users. This is an exciting, organic collaboration between two complementary travel businesses that will provide both companies' corporate clients with unique travel options and incredible savings. 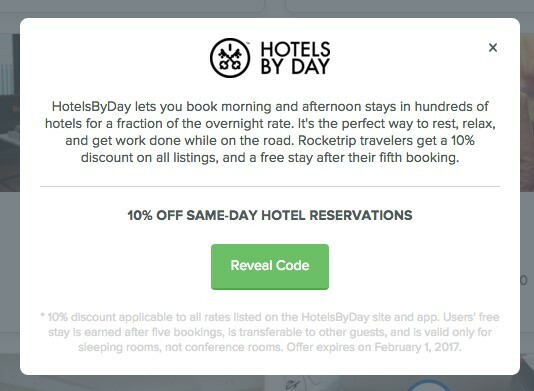 HotelsByDay is the leading day-use hotel-booking website where travelers can reserve luxurious, conveniently-located hotel rooms at competitive prices in major cities across the globe-- for the day. Rocketrip is the leading corporate travel software program that rewards employees for beating their personalized budget set by a sophisticated algorithm based on real-time market pricing. This is an exciting, organic collaboration between two complementary travel businesses that will provide both companies’ corporate clients with unique travel options and incredible savings. Hotels By Day will give Rocketrip users access to exclusive rates and free hotel stays as a part of this partnership, not to mention convenient, affordable and comfortable options for layovers, business meetings and presentation preparation. By giving Rocketrip users exclusive access to Hotels By Day’s roster of day-use hotels at a discounted rate, the two companies are empowering those users with multiple options that will satisfy their travel needs and their employers’ budgetary parameters. It’s a win-win for everyone involved! Hotels By Day was founded in 2015 and has recently been featured in GOOP, Travel and Leisure, NBC and the Boston Globe and is seeing exponential growth in both customer use and hotel partnerships all over the world.